Young Carlos has been left at the doorsteps of an orphange, located in a remote section of Spain; it is becoming more and more difficult for the headmistress to walk as her artificial leg becomes a greater burden; soldiers fighting in the Civil War are quickly approaching; there is an unexploded bomb in the central courtyard of the building and rumors of gold hidden somewhere in its catacombs; and the ghost of young murdered boy, Santi, wanders the halls. 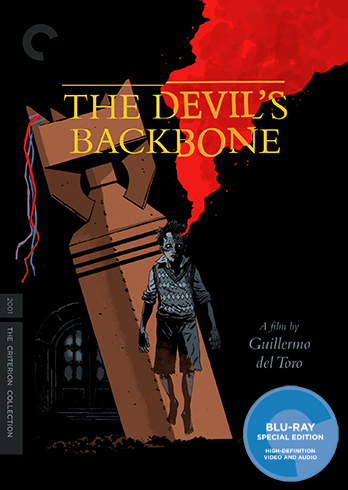 And all these various elements collide in the brilliant gothic horror story, The Devil’s Backbone, directed by Oscar-winner Guillermo del Toro. The film deservedly won raves and was released in a 2-disc collection by Sony Pictures a few years ago. It received a much-deserved upgrade with The Criterion Collection edition on Blu-ray. A much-needed new digital film restoration has done justice to the sun-soaked exterior shots of the orphanage while simultaneously lending an air of creepiness to the night-time scenes of the building’s haunted interiors. © David-Kevin Bryant. Unauthorized use and / or duplication of this material without express and written permission from this blog’s author and / or owner is strictly prohibited. Excerpts and links may be used, provided that full and clear credit is given to David-Kevin Bryant / TheConceptRepublik with appropriate and specific direction to the original content.